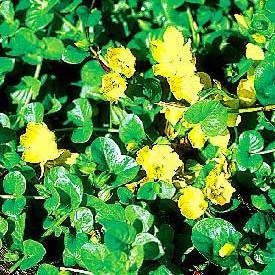 Creeping Jenny is a vigorous, spreading groundcover plant that can be very useful in moist, shady situations. Plants form a low mat of bright green rounded leaves, bearing bright golden-yellow flowers from late spring into the summer. Excellent in pots and tubs, or cascading over walls. Too vigorous for the rock garden. Since the stems root into the ground wherever they touch, this plant is easily increased by simply moving new plantlets in spring or fall. Best as a lawn substitute, otherwise this can escape into lawns or borders. Semi-evergreen in mild winter regions.